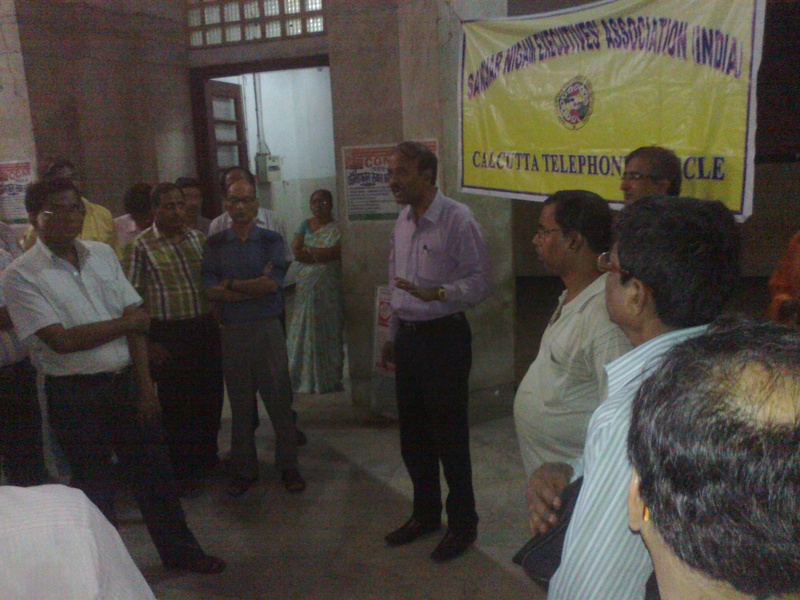 Com Dilip Saha, CS, Com Nirmal Sarkar President and Com Aparesh Ghosal CWC member met GM/HR & Admin to convey severe resentment of the executives for non-renewal of SDE/LA pending since last more than three months, non consideration for further DE/LA given crucial posts of DEs are under additional lookafter charge, inordinate delay in sending duly filled in CVO proforma for consideration in DPC for either regular/lookafter/EPP promotion, etc. Association clearly demanded to rationalise the system and ensure the CVO proforma/ renewal takes place in time, henceforth. GM/HR assured to focus seriously on the issue. Association queried on the latest position in respect of LICE held for promotion to the cadre of JTO in which none qualified. GM informed the concerned section to put up the file and conveyed while taking any decision the points mooted by this association shall be contemplated upon. Association emphasized on ascertaining the questions that were not in compliance with the syllabus then come up with the suggestions made thereon. In many areas in field, be it CMTS or Trans or GPON/BB/Extl there is shortage of technical hands. Keeping in consideration the above, association requested to posts technica;l assistants in these areas to increase efficiency in services thus increase in revenue. View Copy of the letter. 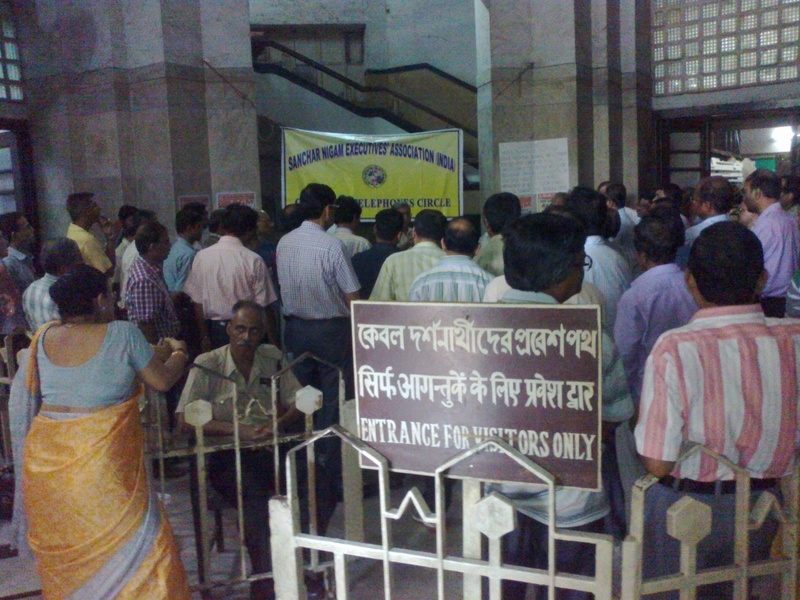 Massive convergence of comrades of Calcutta Telephones Circle at Telephone Bhavan,Ground Floor to protest against the atrocities committed by CGM/Kerela Circle. Members vehemently protested against the unilateral, arbitrary and unwarranted actions of CGM/kerela Circle and made high pitched lunch hour demonstration to record its seething resentment. Kerela is seemingly headed for a steep decline in quality of service and thus revenue due to highhandedness and irrational approach of the Head of Circle, paying scant regard to tested policy and modalities in matter of services set by predecesors and framed/acquiesced by corporate office.Its not a matter restricted to Kerela. It’s more diabolical than expected of, bent upon to hit at the roots of the association. Keeping in view the greater interest of BSNL and constructive roles of SNEA India contributing towards growth/concern of BSNL since decades, its high time to save BSNL and hold aloft the rights of recognised association against such destructive force. We look upon Kerela as model Circle that swam against the tide and trend since last many years to give BSNL the hope to survive and provide immense inspiration to others also. It remained a profitable Circle when lot others were struggling to meet its end. Given such a splendid performance, it becomes incumbent upon us to put and end to such an impasse. So respond spontaneously and heavily to the calls given by CHQ to exert massive organisational thrust on Head of Kerela Circle to restore normalcy. 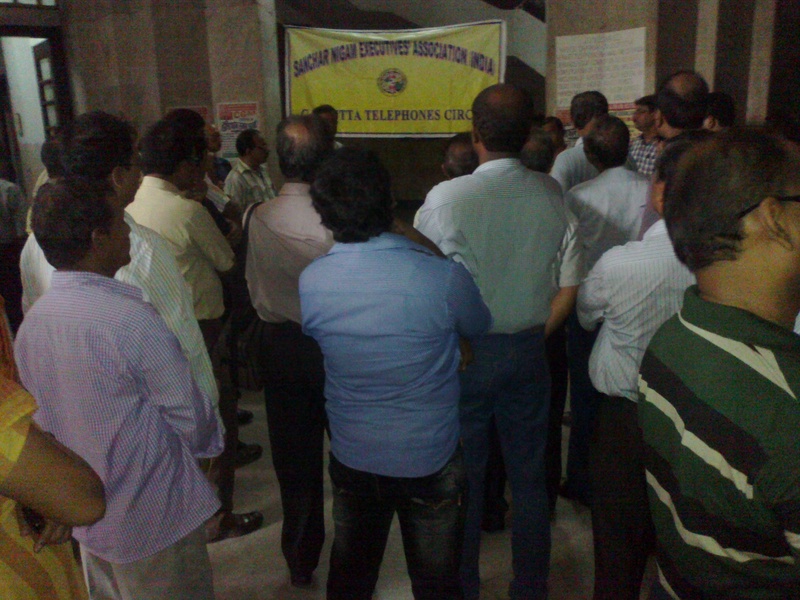 Lunch/closing hour demonstration at BSNLCO, Circle/SSA HQ on 09.07.2014. In total solidarity and support to our Kerala Comrades who are on indefinite hunger strike for the last 14 days from 25.06.2014 and Work According to Rule from 07.07.2014, against the CGMT who destroys the good work culture and systems prevailing in Kerala Circlea and for protecting the Circle, lunch/closing hour demonstration will be held at BSNLCO, Circle/SSA HQs on 09.07.2014. Make all preparations for making the programme a grand success in support of our comrades. Irrational approach and motivated decisions of CGM/Kerala pushing an exponentially growing and highly emulating Circle to point of disaster. 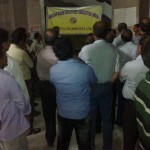 Immediate and strong intervention needed to rein in arbitrary and unwarranted actions of CGM to spoil a very healthy and congenial prevailing working environment so as to arrest fast decline of Circle. 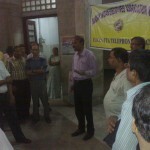 Concerned CGM’s complete lack of commitment and interest towards growth of BSNL well established. 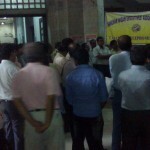 Our comrades in Kerela are agitating to see early resolve of contentious and core issues like a) creating a healthy environment in Kerala circle by stopping large scale demoralization and humiliation of executives, b) shortage of store, and man power for operation and maintenance work c) reduction of posts in the name of rationalization against staffing norms which falls beyond the jurisdiction of CGM, d) non settling of important HR issues in the Circle, e) Transfer of Executives from SSAs having acute shortage in the name of so called long stay simply for the sake of transfer against the provisions of policy of BSNL CO and thereby creating further shortage, e) Large scale displacement of Executives from SSAs against the transfer policy etc etc. The highly provocative and vindictive actions of CGMT/Kerela Circle are only adding to further aggravation of the ground situation and destroying the circle to its root. As members of responsible association, it becomes incumbent upon us to put an end to such irrational dominance and restore normalcy in greater of BSNL. 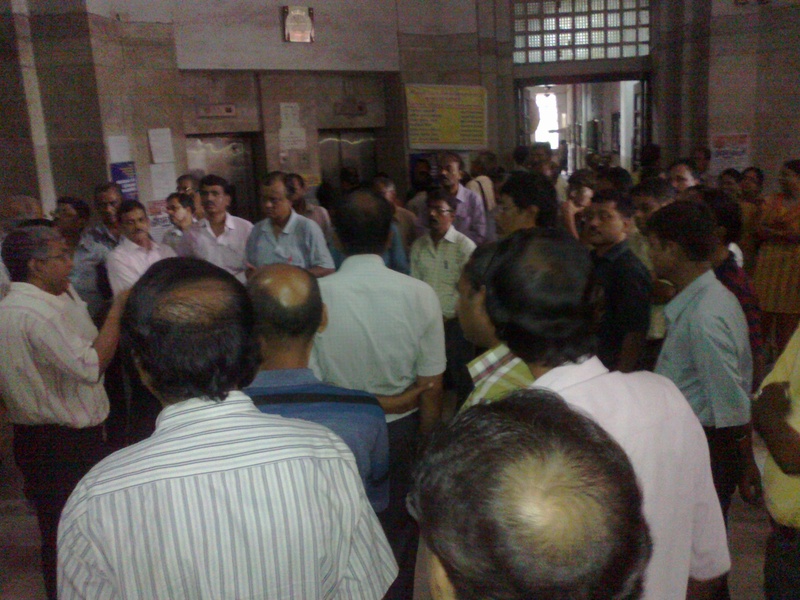 SNEACTC call upon members to join lunch hour demonstration on 09/07/2014 at Telephone Bhavan/Ground Floor. 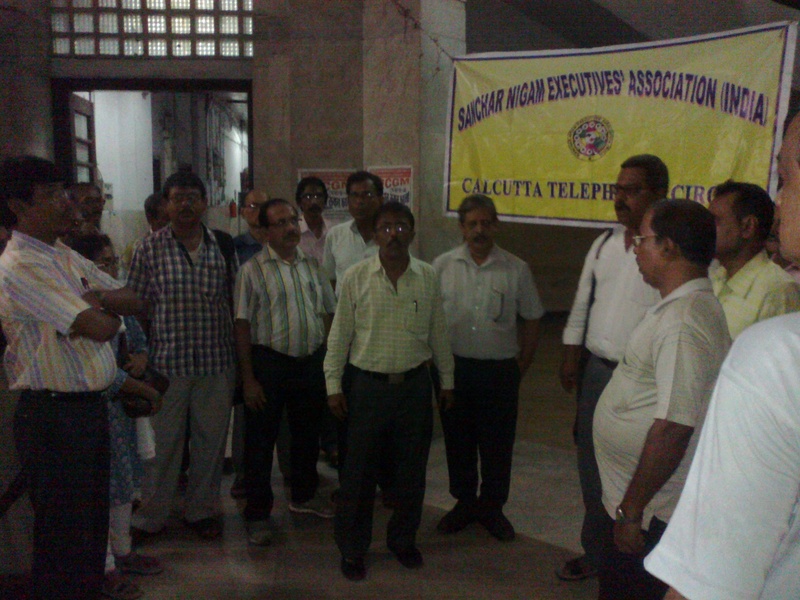 Following the meeting with CGM/CTD, Com Dilip Saha CS and Com Nirmal Sarkar President met GM/HR & Admin to convey CGM’s positive gesture in regard to the plight of the TTAs who had appeared for LICE for promotion to JTO but unfortunately none could qualify due to stiff standard of questions not compatible to syllabus set for the purpose. Association requested to identify such questions and award full marks against each irrespective of attempt made by the candidates. Or otherwise, committee so formed must categorically conclude on standard of questions set against the syllabus provisioned in R/R. This will grant justice to these candidates in retaining their seniority with respect to the candidates who qualified in the same exam in other circles. 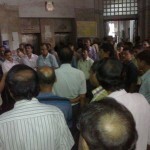 Association drew attention in regard to the serious incident of collapse of staircase in P&T Qtr SaltLake, yesterday. It is fortunate that occupants were rescued and are safe. It is also informed that there is always a paucity of fund to undertake repair and renovation of these buildings thereby endangering the lives of the occupant. GM/HR & Admin spoke of forming a committee with representatives of Civil & Electrical Wing; first to indentify the buildings completely unsafe to reside and then abandoning the same on immediate basis. 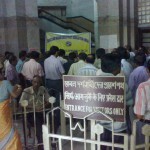 Queried about fund for repair, GM conveyed the same shall be taken up with GM/finance. Association expressed serious concern about these ramshackle buildings and reminded on how the matter was seized with former CGMs too. The matter should have got utmost priority by now to avoid incidents of collapse, injury to occupants etc in future. 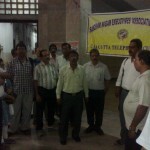 Association looks forward to the action taken by the committee till now. 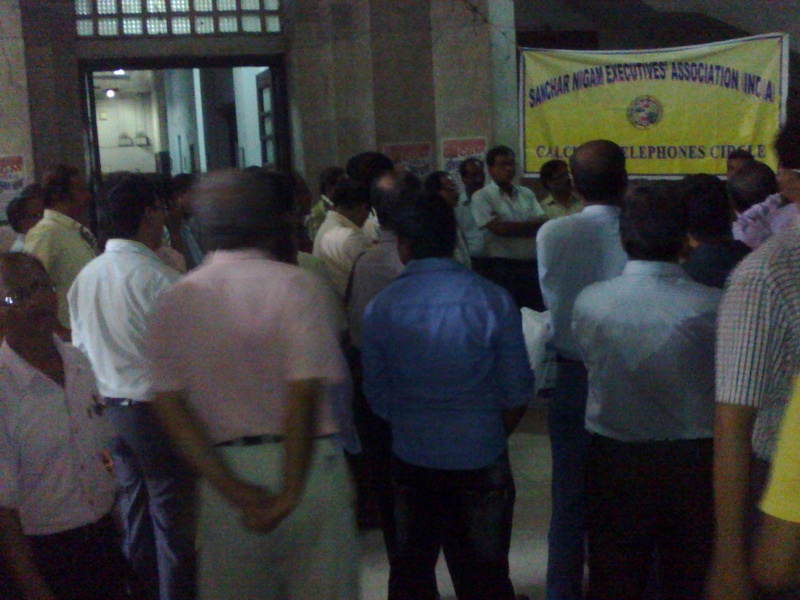 Association once again reminded about postings in some critical area in the cadre of DE/SDE. Com Dilip Saha CS and Com Nirmal Sarkar President of SNEACTC met Shri K K Sapra CGM/CTD to place a brief observation collated from various terminals and fields in respect of CMTS and Transmission Network. Association placed a brief account on root causes responsible for overall decline in quality of service and suggested to strengthen the existing BTS mntce and Transmission Route teams and also form new ones in both the wings. These wings require deployment of additional staff to maintain services at optimal level to the satisfaction of the customers. 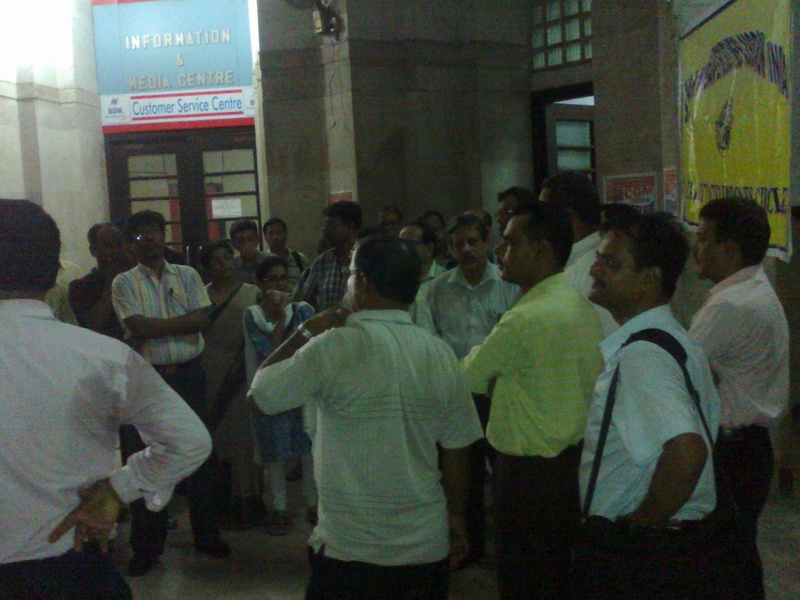 Association conveyed to CGM about some commendable initiatives taken by executives of CMTS in consultation with GM/CMTS to provide increased bandwith in Node Bs bypassing the HUB and making Node Bs in 3+0 configuration. This resulted in increased data usage by over 100 GB/day. However, it is observed that large number of BTS faults take place every day, of which a substantial number gets restored automatically due to Mains (i.e Power Supply), Rest happens to be due to equipment or Trans/optical fibre cut. In matter of cable cuts, the situation warrants to convert large and critical linear chains of BTSs into ring topology with network management system. CGM expressed grave concern over weak transmission mntce and felt the units in CTD must first identify the works to be executed and then rationalize the system for maintenance. He informed of reintroducing fault docketing system in Transmission and provisioning of daily report of faults to all concerned so that the staff can commence the work for restoration at the earliest. At this point, association intimated how executives in CMTS introduced a software mechanism to generate report of faults and sms the same over 24*7 to executives concerned. Association intimated about myriad projects undertaken by KMDA, KMC, RVNL, Reliance JIo, NHA(I) that are underway in Calcutta since last couple years and would likely to continue for few more years. The execution of the projects lead to very frequent and indiscriminate damage to optical fibre cables resulting in major faults to CMTS network, Trans systems, DSLAMs etc. CGM acknowledged the factors but appealed to continue to work in the face of limitations as challenge to turn around Calcutta Telephones with grit, determination and optimism. 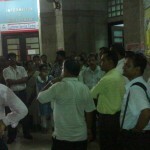 He felt the necessity for Trans Eqpt (ADM-16 & others) and informed to have taken up the matter with Corporate Office. This will very well address to bring the DSLAMs in ring besides CMTS resulting in catering stabilized service and thus increase in revenue. Association drew attention in regard to inoperative tender meant for optical fibre mntce work and how the field officers are facing severe constraints in taking up O F cable restoration work on urgent basis. Also work for diversion of cables due to RVNL projects is unable to get underway for same reason and there is every likelyhood of existing cables getting damaged soon RVNL starts piling work given they have already paid the claim raised by Calcutta Telephones. CGM informed that the matter is already under intimation and stated to address the matter on priority within the provision of the rules. The Competent Authority has approved the entrustment of additional charge of the post of Chairman & Managing Director, Bharat Sanchar Nigam Limited (BSNL) to Shri.A.N.Rai, Director(Enterprise), BSNL for a period of three months w.e.f. 01.O7.2O14 or until further orders, whichever is the earliest. SNEA(I) Congratulates him and wish him all success in his new assignment. GS and AGS met Shri.A.N.Rai, and congratulated him on assuming the charge as CMD, BSNL.